Sonia Boyce, Six Acts, 2018. Six-screen film and wallpaper installation, 15 min. Photography by Michael Pollard. Sonia Boyce MBE gained prominence as part of the Black Arts Movement in the 1980s. Her work explores power relations and the intersections of gender, sexuality, race and class. In the last two decades Boyce has worked with people in collaborative and often improvised situations. The documentation or ‘leftovers’ of these unpredictable encounters are often used by Boyce to make artworks in media such as photography, film and wallpaper. For her solo exhibition at Manchester Art Gallery this year, Boyce worked closely with the museum’s team, inviting artist-collaborators and gallery users to create a new artwork, Six Acts, which the Contemporary Art Society has acquired for the institution. The starting point for Six Acts was a series of conversations about the gallery collection and how it is displayed and interpreted. Boyce and a group of gallery staff were specifically interested to explore how the politics of class, gender, race and sexuality in Manchester Art Gallery’s 18th and 19th century painting displays can be reconsidered today, as they have remained the same since the gallery reopened in 2002. As part of this process, an evening gallery takeover took place in January 2018. Wearing a long white dress, artist Lasana Shabazz performed in response to a number of art works on display. Shabazz fictionalised the character of Ira Aldridge, a renowned 19th century Shakespearean actor, stepping out of his portrait Othello, the Moor of Venice (1826) by James Northcote. In addition, contemporary drag artists Anna Phylactic, Cheddar Gorgeous, Liquorice Black and Venus Vienna were invited to respond to artworks of their choice and to the title of one of the galleries, In Pursuit of Beauty. One of the six performative acts that night was the temporary take-down of a painting Hylas and the Nymphs (1896) by JW Waterhouse, replacing the painting with a series of questions and deliberately leaving a space to encourage further conversation. Visitors covered the wall with written notes in response to the temporary removal of the painting and the act prompted a huge public reaction. 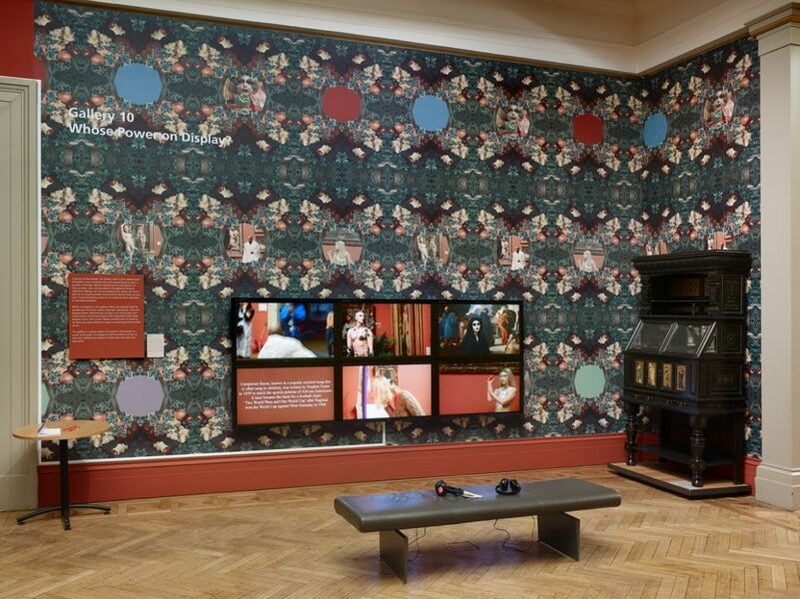 The gallery takeover was filmed and photographed and Boyce has worked with this documentation to create the film and wallpaper installation Six Acts. Each of the six screens represents a performative ‘act’ that took place during the gallery takeover. The wallpaper continues Boyce’s interest in using this medium to document and represent her process-based work. 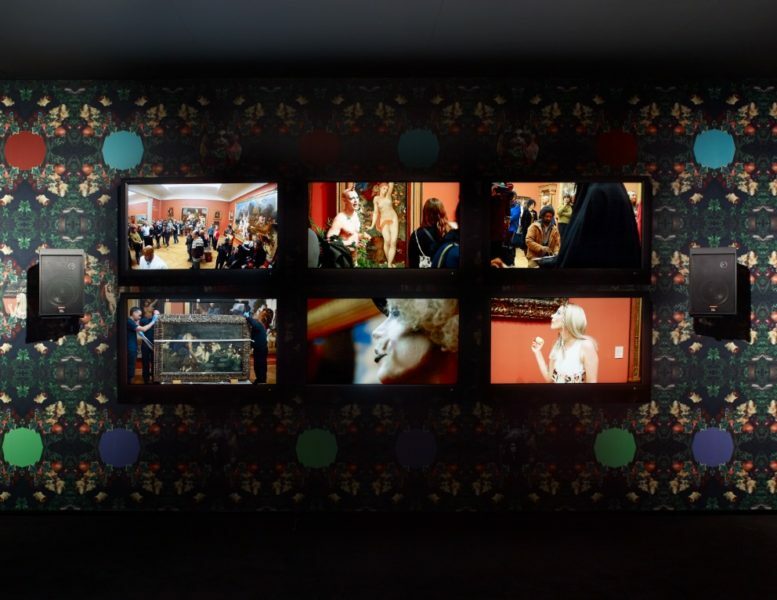 It is a collage of photographs of the artists who performed during the evening juxtaposed with the leaves that Cheddar Gorgeous used as part of his performance, visually relating to Victorian wall paper design. With Six Acts, the boundaries of the artwork have become fluid as the film installation sits within an ongoing process for the gallery team and gallery visitors to explore issues of representation and the role of public collections today. Sonia Boyce (b. 1962, London, UK) has exhibited widely since 1990s. Recent exhibitions Manchester Art Gallery; Social Work, Frieze London (all 2018); ICA London (2017); 56th Venice Biennale of Contemporary Art (2015). During Frieze London (2018) her work was acquired through the Frieze Tate Fund. Boyce is currently Professor of Black Art and Design at the University of the Arts London and is the Principal Investigator for a 3-year Arts and Humanities Research Council (AHRC) funded project Black Artists and Modernism (BAM).